The body length of this insect is about 15 mm. The antennae are long and slender. Like other snakeflies, Phaeostigma notata is able to raise its head above its body while resting. This motion is like that of a snake getting ready to strike. Adults have four wings that are clear and membranous. The wings are veined with a conspicuous spot. It is located on the front margins near the tips. While Phaeostigma notata is at rest, it holds the wings up rooflike over the back. 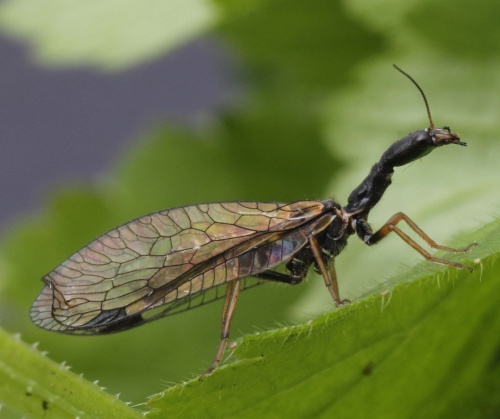 Female snakeflies have a tail-like ovipositor which is used to lay eggs in bark crevices etc. Thought to spend most of their time high up in trees, but sometimes seen on the trunks. The adults emerge from early May onwards. The larvae live on or under loose bark and feed on other insects. This is a poorly recorded group and information about status is sparse, but it seems that this species is fairly frequent and widespread in England and Wales at least. Status in Leicestershire and Rutland not known, but thought to be fairly frequent.